The launch went as planned. 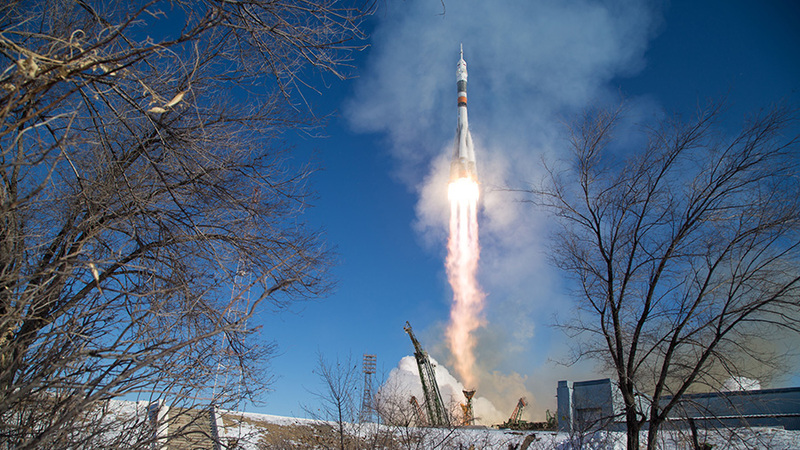 Our Soyuz spacecraft did a great job getting the three of us to the International Space Station (ISS). A week later, it all seems like a blur. The bus driver played me a video of my family and friends delivering their good luck messages. After exiting the bus at the launch pad, I was fortunate to have the Soyuz chief designer (Roman) and NASA’s associate administrator for Human Exploration and Operations (Bill Gerstenmaier) walk me to the stairs and elevator that would take us to the top of the rocket for boarding. The temperature at the pad was approximately -17 degrees centigrade, and we were wearing the Russian Polar Bear suits over our spacesuits in order to stay warm. Walking in these suits is a little hard, and I was happy to have Roman and Bill helping me. We walked into the fog created by the systems around the rocket, climbed the ladder, and waved goodbye. My last words before launch were to Bill, “Boiler Up!”. Bill is a fellow and very well-known Boilermaker. We strapped in, and the launch and docking were nominal. But I will add that the second stage cutoff and separation, and ignition of the third stage was very exciting. We were under approximately 4 Gs when the engine cutoff, which gave us a good jolt forward during the deceleration and then a good jolt back into the seat after the third stage ignited. I looked at Anton and we both began to giggle like school children. 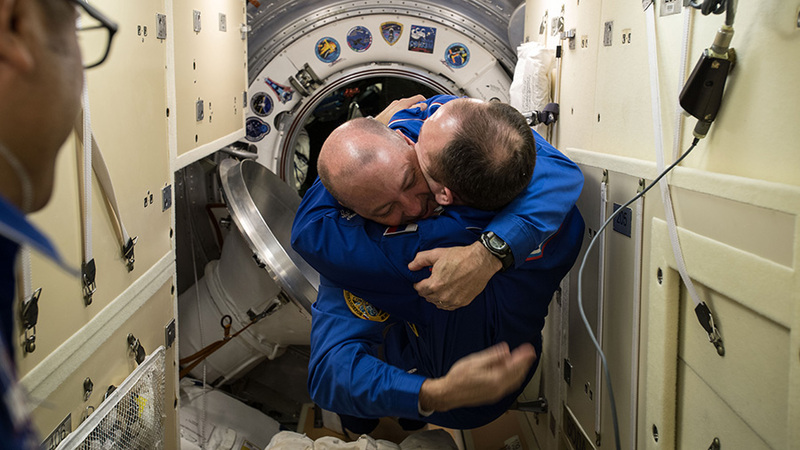 International Space Station Commander Alexander Misurkin welcomes newly arrived Flight Engineer Scott Tingle following Soyuz spacecraft hatch opening. We spent two days in orbit as our phase angle aligned with ISS. Surprisingly, I did not feel sick. I even got 4 hours of sleep the first night and nearly 6 hours the second night. Having not been able to use my diaper while sitting in the fetal position during launch, it was nice to get out of our seats and use the ACY (Russian toilet). Docking was amazing. I compared it to rendezvousing on a tanker in a fighter jet, except the rendezvous with ISS happened over a much larger distance. As a test pilot, it was very interesting to watch the vehicle capture and maintain the centerline of ISS’s MRM-1 docking port as well as capturing and maintaining the required speed profile. Just like landing at the ship, I could feel the vehicle’s control system (thrusters) making smaller and faster corrections and recorrections. In the flight test world, this is where the “gains” increase rapidly and where any weaknesses in the control system will be exposed. It was amazing to see the huge solar arrays and tons of equipment go by my window during final approach. What an engineering marvel the ISS is. Smooth sailing right into the docking port we went! About an hour later, after equalizing pressures between the station and Soyuz, we opened the hatch and greeted our friends already onboard. My first view of the inside of the space station looked pretty close to the simulators we have been training in for the last several years. My first words were, “Hey, what are you guys doing at Building 9?”. Then we tackled each other with celebratory hugs!